Up until now, cooking dailies have been reserved for the higher level player – with the release of the Roc cooking dailies (with the Burning Legion expansion – requirement level 70) and then the Dalaran cooking dailies (with Wrath of the Lich King – requires level 71). These cooking adventures have been a fun way to earn some gold, get experience, new recipes, and earn reputation. With the impending release of Cataclysm expansion and the new world that has emerged from the Shattering, Blizzard has introduced new cooking (and fishing) dailies in Stormwind City and Orgrimmar similar to the non-factional dailies available in Dalaran and Shattrath. Like the Dalaran dailies and in marked contrast to the Shattrath dailies, most (if not all) of them can be performed in and around the Stormwind (Alliance) and Orgrimmar (Horde). Also, like the Dalaran dailies, these new dailies give cooking awards (Chef’s awards) which can be saved to buy 450+ level cooking recipes. Unlike both the Dalaran and Shattrath dailies, these “old world” dailies are available from level 10 onwards and award one or two cooking experience points (depending on level). Penny’s Pumpkin Pancakes (harvest 6 Stormwind Pumpkins in the new farm section next to Olivia’s Pond in north of Stormwind City. To reach this area you should go through the new gate behind the engineering trainer in the Dwarven district). Each daily awards A Chef’s Award, + 1 cooking skill, alliance reputation (including Gilneas rep) and experience (if not already maxed out). Next to Robby is the Sous Chef, Barrio Metalli who sells 450+ recipes (requires level 80) and a crate of tasty meat (for Chef’s Awards). Each daily awards A Chef’s Award, + 1 cooking skill, horde reputation and experience (if not already maxed out). 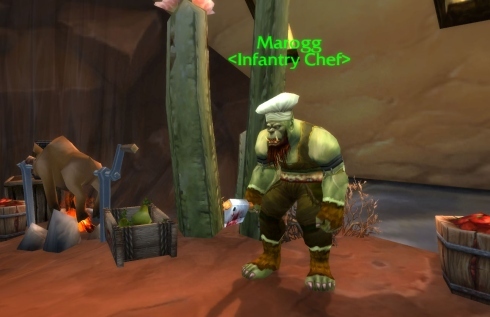 Next to Marogg is the Sous Chef Shazdar, who sells 450+ recipes (require level 80) and a crate of tasty meat (for Chef’s Awards). There are also a couple of associated achievements: Let’s Do Lunch for completing the five dailies in Stormwind City (Alliance) or Orgrimmar (Horde) and the various Cooking Awards (e.g. for one, 50, 100). So, if you haven’t yet got into cooking, now may be the time to give it a go though, of course, it is going to take more than a few dailies to level your cooking or to earn the title of Chef. In the midst of the chaos and shifting uncertainties of cataclysmic change, it is comforting to think that the simple pleasures of life can still remain. The preparing, sharing and eating of food is at the heart of family life, significant celebrations and community building across races, factions and cultures despite their differances .